It's officially autumn! In most of Canada, there is nip in the air and the tree leaves are starting to display their vivid colours. Most of us are thinking more about being indoors and entertaining friends and families. With Thanksgiving fast approaching, we are all looking for ideas to decorate our tables and homes with some beautiful fall looks. Here are a few easy ways to beautify your home for fall, using any Autumn Collection bouquet. The big advantage to buying a professional bouquet is that the Bloomex florists have done most of the work for you—so you get amazing results with little guesswork or effort! First, select a beautiful fall-themed bouquet. Click to check out our special Autumn Collection (starting at only $19.99) for a list of bouquets that would work perfectly with any project : Autumn Collection Bouquets. Next, select your project, have fun, and enjoy the rave reviews! Select a medium-sized pumpkin, and a cylindrical container of choice that is watertight. Place container on top of pumpkin, trace around it, and cut out the top. Scoop out and clean interior of pumpkin. Place container inside, add water and flower food. Add the bouquet of choice and presto, you have a wonderful statement piece for your table or mantle this Thanksgiving, or place outside on your porch to welcome your guests. You can add extra touches like mini scarecrows or branches if you like. If you want to decorate for Hallowe'en, add some fun pieces from the dollar or craft store, such as bats, black cats, spider webs, or witches. 2. Fall Wreath with Real Flowers. 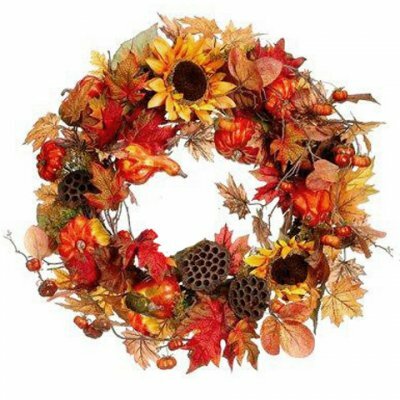 Pick up a grapevine wreath and some floral wire at any craft store location, and select one of Bloomex's beautiful fall bouquets.The flowers and other natural items have been carefully selected by professionals to work together perfectly, so you have less effort for spectacular results! Hang the wreath above your mantle or in your dining room before a special celebration, or place a medium-sized wreath on your holiday table with a glass candle holder in the centre for a natural and beautiful centerpiece. You can find a woven cornucopia at most craft stores this time of the season. Pick up some floral foam at the same time. 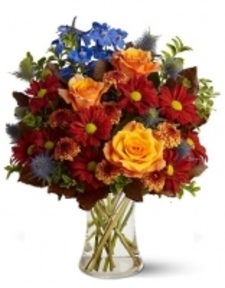 Order and receive your autumn bouquet of choice. Cut the foam as needed and dampen it with water. Insert the foam into the cornucopia. Insert the flowers from your autumn bouquet into the foam, to help secure them and keep them moist and fresh. Place the cornucopia on a tray or a round plate if you are concerned about any water dripping from the foam. This is sure to be a spectacular centerpiece for your table or let it occupy a place of honour on a cocktail table or mantle. 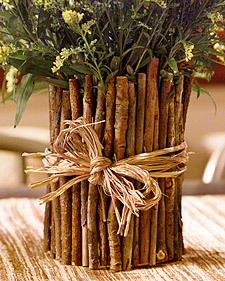 For the more crafty types, make a vase using twigs. Find, clean and dry a large tin can (as from canned fruits or vegetables) or other cylindrical container that is watertight. Collect some small sticks or twigs during your next nature walk. Wrap the can with brown craft paper and secure it with glue, using a glue gun. Use the glue gun to glue the twigs vertically, all around the can. Tie a ribbon over the twigs. Fill with water and add flower food. 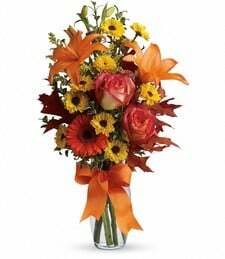 Set in your fall bouquet of choice, and enjoy the rave reviews! Get your kids involved, for a fun family project! That way you will enjoy the process, as well as the results. And your guests will be raving about any of these wonderful fall flower decorations. It's officially autumn! In most of Canada, there is nip in the air and the tree leaves are starting to display their vivid colours. Most of us are thinking more about being indoors and entertaining friends and families. With Thanksgiving fast approaching, we are all looking for ideas to decorate our tables and homes with some beautiful fall looks. Get your kids involved, for a fun family project! That way you will enjoy the process, as well as the results. And your guests will be raving about any of these wonderful fall flower decorations.